Two classes from Bega Valley Public School have been helping with the regeneration of Kiss’ Lagoon. The Year 6 pupils and their Kindergarten buddies walked to the western side of the lagoon where they planted grasses, shrubs and trees in the space where willows once grew. The planting was another element of Bega Valley Shire Council’s Bringing NRM to Town – Bega Urban Floodplain Wetlands Restoration Project, which is funded through the Environmental Trust. The students planted 540 new plants as part of the regeneration of this very visible Bega landmark. While they were there, they were thrilled to watch moorhen chicks in a nest and they walked back by the longer route to see if there were any cygnets visible from a nesting black swan. The Bega Valley Primary School and two other schools also took part in stormwater education when they were visited for an informative discussion about how our stormwater becomes polluted. Children from St Patrick’s Primary School and Mumbulla School for Rudolf Steiner Education created postcards to help encourage better behaviour about litter and natural pollutants such as leaves, silt and animal droppings. Many of the children did not realise that washing the car on the street and letting the water run down the drain is against the law. They took home the important message that the drain is for rainwater only. Any local pollution should be reported to Bega Valley Shire Council on 6499 2222. 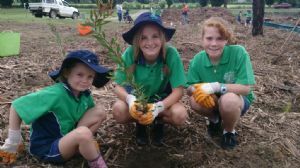 Photograph: Bega Valley Primary School pupils, Anne Lucas, Kira Cesnik and Bianca Mackinnon plant native species at Kiss’ Lagoon.